There are 418 guest rooms in the hotel with 396 Superior and Deluxe Rooms and 21 Suites. 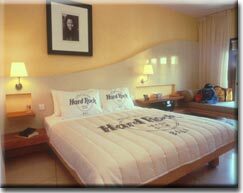 The rooms and suites are situated in 6 blocks named after different musical eras: Rock ‘n’ Roll, Blues, Reggae, Psychedelic, Alternative, Pop. Rates are nett, inclusive government tax and service charge. Rates are not applicable with any other special offers or discount. Reservation at least 7 days before to guarantee confirmation. Flight details are required for airport transfer service. HRHB does not refund any un-used service within the room rate. Cancellation within 72 hours prior to arrival will be charged for one-night. Cancellation within 24 hours or no show will be charged at full amount. Compulsory New Year dinner at published rate. 50% payment is required 3 days after making a reservation which we will advise the client directly. Room is subject to availability (no guarantee). 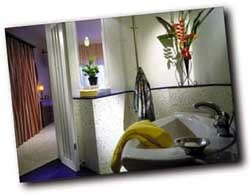 Cancellation is charged 100% on the total room nights reserved for notification received less than 45 days. Full payment is required at the latest 60 days before the arrival. All payment and deposit is non refundable.